Bush Mallow is a common, fast-growing shrub with small pink flowers growing on slender wand-like stems. It can be found in bloom as late as October, though it is generally more noticeable in the late spring (beginning in April) and summer months. Often these plants will grow in colonies and while the plants are quick to establish, they do not always live very long, sometimes only a year or two. 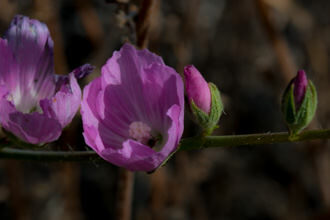 The flowers of Bush Mallow appear in clusters along the stems. Pink to lavender in color and cupped in shape, each flower is about an inch or so in diameter, with 5 petals and 5 sepals. If you have ever seen a Hibiscus flower then you may recognize the similarities of the flowers - particularly the reproductive organs of the flower. Leaves are distributed sparsely along the stems and are oval or round with 3-5 lobes. Both stems and foliage are gray-green in color and covered with hairs. Animals and insects (rabbits, deer, caterpillars, bees, beetles etc.) derive sustenance from the various parts of the plant. Trail workers who've encountered this plant may remember it as one that has many branches and is easy to cut, probably owing to its fast-growing nature. The genus name Malacothamnus is Greek for "soft shrub". The species name fasciculatus means "clustered" or "bundled" in Latin, referring to the leaves and/or flowers. Other members of the Mallow family include hibiscus, okra, hollyhock, cotton, and a plant named Althaea officinalis, whose roots used to be used to make marshmallows, although now this sweet concoction is made with other ingredients. Last modified: August 14 2018 15:51:56.